Vegan Runner Eats » Marathon Training » Weeks 12 and 13 of Marathon Training. My First Injury Scare. But first, let me praise the wonderful city of Seattle and its surroundings, where I got to spend weeks 12 and 13 of my marathon prep! 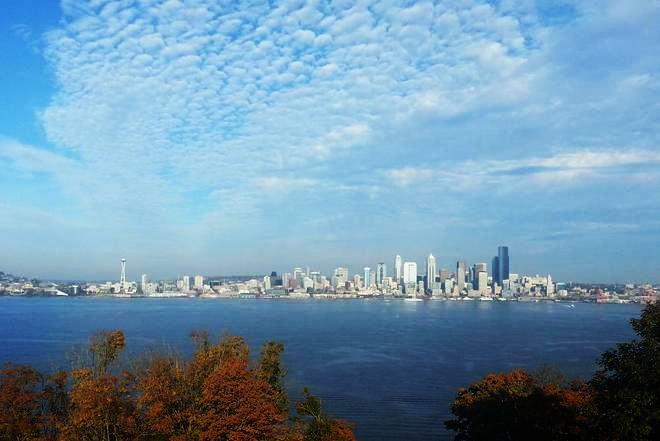 But let me explain everything in a chronological order here, all while sprinkling in some pretty pictures of Seattle area in fall. Week 12 started out great. I had a lot of confidence in my running after a 12.74 mile run previous Friday. My body got used to colder temperatures of Seattle, plus I knew that no matter what the temperature was at the beginning of my run, I would get significantly warmed up after a few minutes. I also adopted a habit of taking a cell phone with me, which I never did before (I run without headphones, even for the longest runs). I figured that having a cell phone while running in a not very familiar area was generally a good idea in case I ran in some trouble. 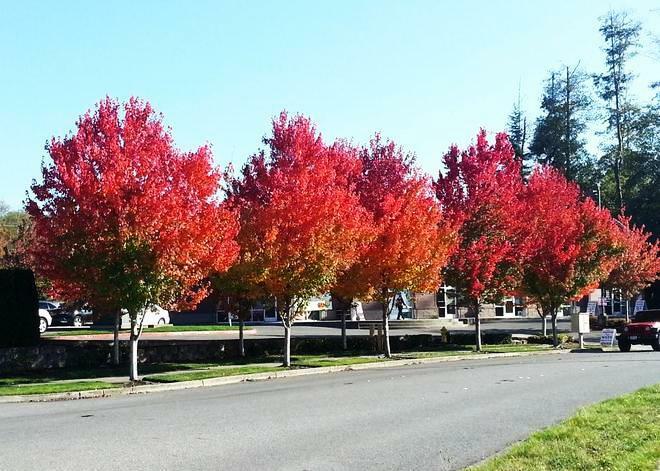 I ran past these trees every time I headed out for a run, and in the course of three weeks I saw them change their color. I had a good run on Monday, went to the gym Wednesday, had another shorter run on Thursday, and by Friday morning I felt strong and confident, looking forward to a 15-mile run in the afternoon (I decided against doing long runs on the weekends while we were in Seattle so that to have more time and energy for exploring the area). At around 11 am, I headed outside for my run, armed with a water bottle, a cell phone, and a couple gels. I estimated to be done some time after 1 pm if I was running a 9-10 min/mile pace. The weather was not cooperating: the day started out cold and foggy, and soon after I started running, the fog dissipated, and a cold, annoying rain started drizzling. I figured that I just had to deal with it and keep going. Every runner goes through some bad weather experience sooner or later, and unless it’s a torrential downpour or a hurricane, it’s usually not too bad. Luckily, my husband was about to go to lunch at work, and – ta da! – I had a cell phone to call him! He eventually picked me up and drove me back to the hotel, but I was still doomed by the thought of possibly having to give up not only my long runs in preparation for the marathon, but also THE MARATHON itself! I was struggling with the idea of failing at my Vegan Marathon Challenge – something that encouraged me to start this blog! First, even if I didn’t run the marathon, that wouldn’t mean that the idea of being successful as a vegan marathoner is nonsense. Thousands of people on vegan or plant-based diet successfully run marathons and ultra marathons all over the world. However, no runner is injury-proof, regardless of his or her diet, and most longtime runners eventually experience some kind of injury. The fact that I was having trouble with my foot muscles doesn’t mean that my diet was failing me. Week 13 of my marathon training started with me feeling quite bummed out, naturally. No, I didn’t give up on all of my intentions and started to indulge in buckets of ice cream while sitting on the couch all day. (Although we did find an out-of-this-world vegan ice cream in a local grocery store! Thankfully, it was too expensive to buy every day.) I went on with maintaining my fitness in the hotel gym, ran up and down the stairs (10 times from the 1st floor to the 5th and down), and even pedaled on a recumbent bike, which I never do. 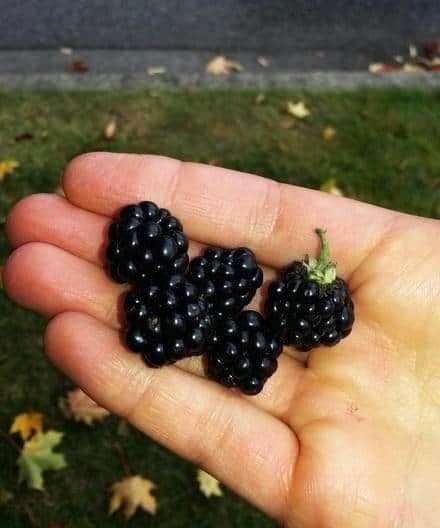 I couldn’t have just walked by these beautiful blackberries that grew everywhere in the area! I went out slower and more cautious than usually. I was paying attention to my every foot strike. The day turned out beautiful and sunny, and I was glad to see all of my favorite spots on the route again. My foot behaved better, although still not perfect. The same muscle started acting up after about 3 miles (the previous time it got bad after 2 miles), but it never got to the point where I had to stop. When I finished, my GPS showed 6.2 miles – not too bad on a painful foot, but far from a 20-miler I intended to do a couple weeks ago on that day. As of today, I am still intending to run the marathon that’s 2.5 weeks away. Since we’ve been back to Alabama, we bought new shoes (more on that next time), and I had a couple shorter runs that went decent. Interestingly, the muscle that was hurting in my left foot before wasn’t giving me any trouble while running in the new shoes, which confirmed my suspicion that all of this was caused by worn-out shoes. I acknowledge that I won’t be able to have a 20-mile run between now and the race (most training plans advise on the longest run 3 weeks before the goal marathon), but if I survive a 10-15 miler the next couple weekends, I might do okay in the marathon. I won’t be looking to set any goals, and I’m fine with a possibility of dropping out in case things go bad, but as of right now, I’m not giving up! A lot of athletes tend to lose their confidence in the weeks before their goal race. Here’s an account by another blogger who is feeling vulnerable two weeks before her dream race – 2013 New York City Marathon. To read my previous posts on training for my first all-vegan marathon, please follow this link. Have you ever had to deal with an injury right before a dream race? Did you choose to skip participating, or did you go through with it? I’m looking forward to hearing your stories or advice! Tagged injury, inspiration, marathon training, Pensacola Marathon 2013, running, Seattle. Bookmark the permalink. 2 Responses to Weeks 12 and 13 of Marathon Training. My First Injury Scare. Sustaining an injury while training is always so disappointing, but at least it seemed to improve over time. Hope the marathon went well! Thanks for sharing!